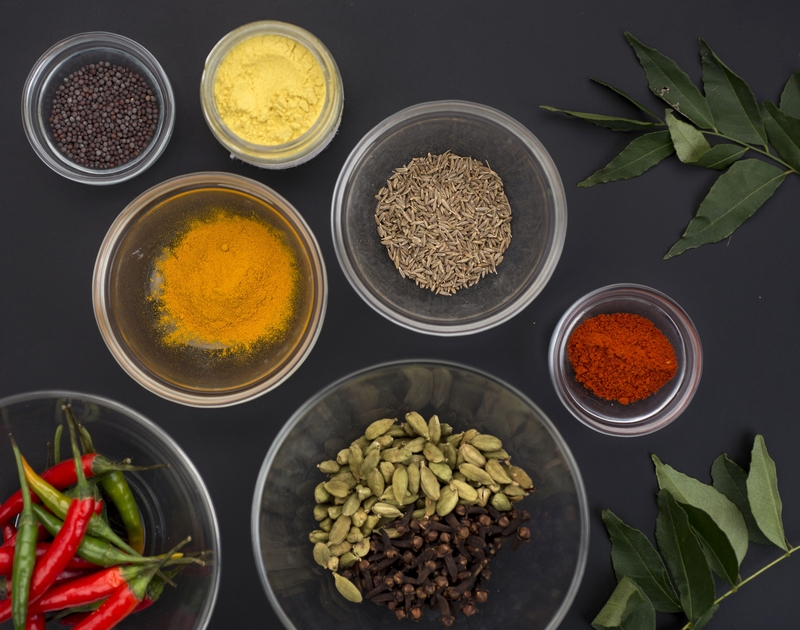 An assortment of spices, including chili peppers, cardamom, cloves, red chilli powder, turmeric, asafetida, cumin seeds, black mustard seeds and curry leaves are vital for preparing dal, the versatile staple made from dried beans. I went to my local Indian grocery the other day looking for dal, but I couldn’t decide which dal to buy. There were so many kinds to choose from, all enticing – bright orange massour dal, canary yellow chana dal, ivory-hued urad dal and straw-colored moong dal, among others. In the end, I bought 10 one-pound packages, each a different color. Dal is as common in India as mashed potatoes are in Minnesota. The word means dried legume, as in lentil or pea. Or chickpea or fava bean. An edible seed that grows in a pod and is hulled and split. Dal is also the name for the thick purée, stew or soup made from these legumes. It may be a nutritious, humble meal served with rice, or it may be just one of several dishes served as part of a more complex meal. It is found on every Indian table every day, rich or poor, rain or shine. The simplest version of dal is a breeze to make. Put split lentils in a pot with water, salt and a little turmeric and simmer them. It doesn’t much matter which kind of dal you use; most cook in an hour or less, some in as little as 20 minutes. If making dal becomes a habit, you may consider using a pressure cooker, as most Indian cooks do. It cuts the cooking time in half. You want to cook the dal until it is completely soft and thick and collapses into a rough purée. For a velvety, creamy texture, whirl it in the blender. If you prefer a bit more texture, beat it with a whisk for a minute to a porridge consistency. The spice blend varies depending on the dish, but it can include mustard seeds, fennel seeds, whole coriander or dozens of other aromatics. The only spice featured in this dal is cumin seed, known as jeera, along with chopped garlic, chiles and finely diced onion. These are heated in a small amount of ghee or oil until lightly browned and fragrant. The ghee and spices are stirred into the dal, transforming it into something sublime. The tadka has done its work; now we have a buttery, cumin-scented dal shot through with flavor. For an easy snack that trumps popcorn, may I suggest a spicy bowl of a sundal? On the beaches of South India, sundal is sold in paper cones by itinerant vendors – great for nibbling with a cold beverage. Put dal, turmeric and salt in a large soup pot, add 7 cups water and bring to a gentle boil, stirring. Make the tarka: Heat ghee in a small skillet over medium-high heat. Add cumin, chile and garlic and cook until cumin is fragrant and garlic is lightly colored, about 1 minute. Add shallot and continue cooking until shallot is softened, about 1 minute more. Pour contents of skillet into pot and stir into the dal. Transfer to a serving bowl or individual soup bowls. Sprinkle with a pinch of garam masala or red chile powder and/or serve with basmati rice, if desired. Dal may be made in advance, refrigerated and reheated. (It will solidify when chilled and need thinning.) Cool to room temperature before refrigerating. It will keep 2 to 3 days. Variation: Wilt 10 ounces baby spinach leaves (or chopped larger leaves) in a tablespoon of ghee with a little minced garlic and ginger. Stir spinach into dal just before serving, and add lemon juice to taste. Makes 6 to 8 servings. Simmer chana dal in a soup pot in abundant lightly salted water until soft but not mushy, about 15 minutes. (If using whole chickpeas, cook for 45 minutes.) Drain and spread out on a baking sheet to cool. In a large wide skillet, heat coconut oil over medium high heat. Add urad dal, chiles, mustard seeds and curry leaves. Let sizzle for a minute until seeds begin to pop, then add asafetida if using. Turn flame to low and add cooked chana dal and gently stir to coat. Add coconut and continue to stir until spices are well distributed. Check seasoning, adding salt and cayenne as desired. Transfer to serving bowl and garnish with cilantro sprigs. Serve warm. Makes 6 to 8 servings.